I spent most of my twenties in Los Angeles enjoying some much needed sunshine (and grad school) after a childhood of Minnesota winters. While Birmingham’s weather is much better than Minnesota’s, I still jumped at the opportunity to go back to sunny LA last month. And although it was fun, Birmingham is not in jeopardy of losing me. Los Angeles, I love and miss you but we aren’t getting back together. The primary purpose of my LA visit was to speak at the inaugural meeting of the Western Legal Leaders Council. This is a new group of law firm COOs from select firms west of the Mississippi put together by Catapult Growth Partners’ Steve Daitch and Irell & Manella’s Mark Hanson. If you have read my blog for any length of time, you know that any time I travel, I do my best to visit some cool spaces. 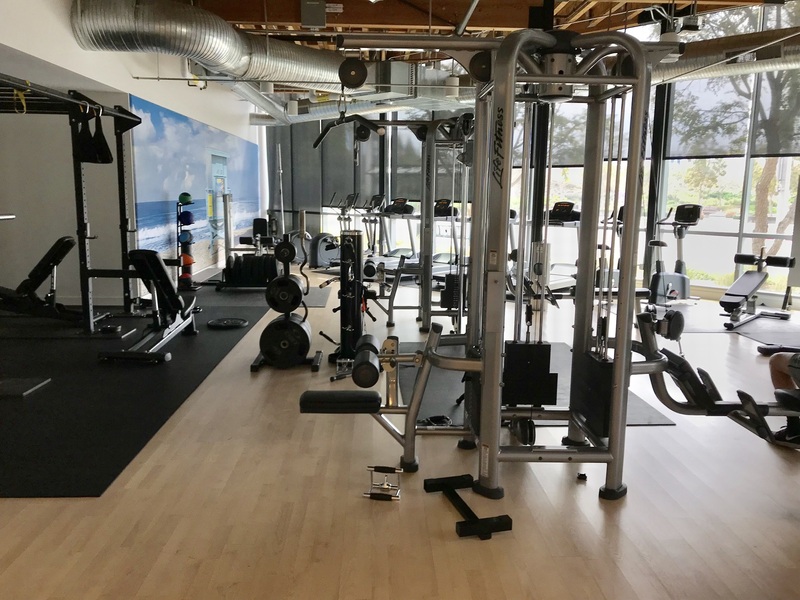 So, when I wasn’t attending the conference, I had the pleasure of touring Yahoo’s Silicon Beach campus, Google’s new campus inside the Spruce Goose hangar in Playa Vista, and The Honest Company’s space. Yahoo, now owned by Verizon, occupies three buildings totaling ~88,000 rsf – each with the same basic footprint. One building contains workspace and a large cafeteria and fitness center. One building contains workspace for Ryot Studio, Xbox and Yahoo Sports. And the last building contains film studios for Yahoo Sports. In which they were recording. With a famous athlete. But wouldn’t let me in. Sigh. All of Yahoo’s buildings have glass exteriors, are two stories tall and have extremely high and open ceilings. The exterior spaces are equally airy and light filled. In fact, there is a beautiful green courtyard between the three buildings with abundant outdoor seating. One of my favorite things seen at the Yahoo buildings? The booths they incorporated for small informal meetings. 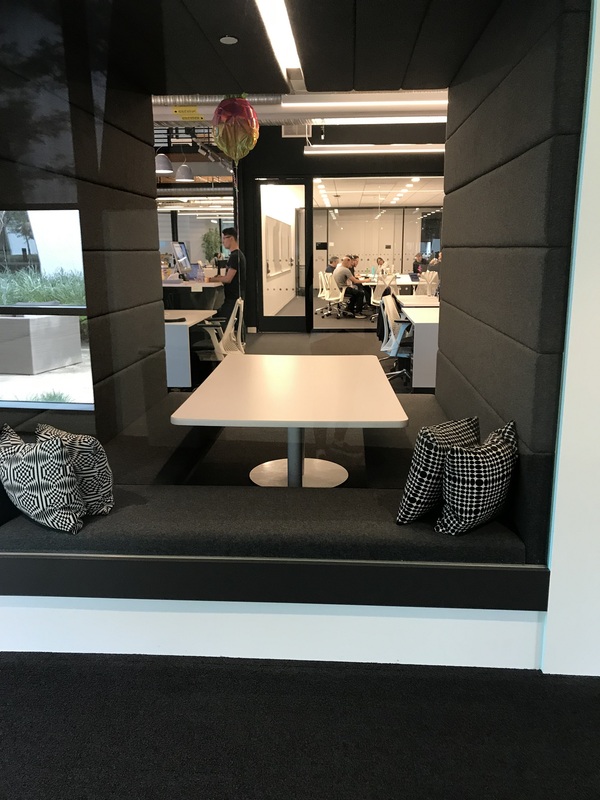 While I realize booths are all the rage in the modern office buildout, these are unique in that one of the “open” walls is not actually open. Instead, it is a glass wall and the booth seating goes around that side. The result is more seating and better audio privacy without compromising transparency and light. Did Verizon’s acquisition of Yahoo change anything in the space? Well, it’s still 100% open plan, but let’s just say the “free snack shelves” are now basically shelves. Don’t feel too bad for the employees; breakfast and lunch are still complimentary. Next it was on to The Honest Company. Its space is as soothing and Zen as you would anticipate given the company’s name and its famous founder. It boasts tons of light and natural materials – from various woods to wool rugs to plants. 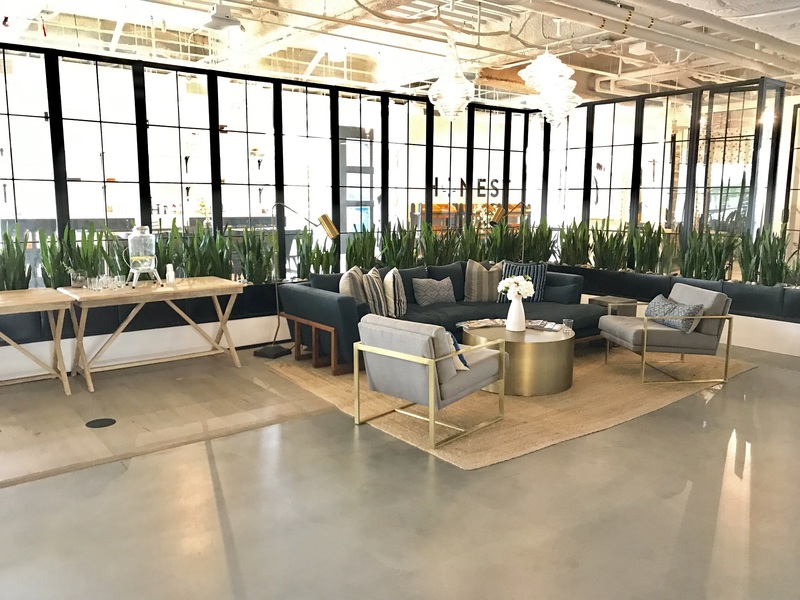 The Honest Company’s employees each have a dedicated workspace which they are welcome to adorn as they see fit. The desk areas are very simple and open but (like Gensler’s offices in Washington DC), they seem full of life and energy. The best analogy I can come up with is it feels like you are working in one of your most hip twenty-something friend’s apartments. 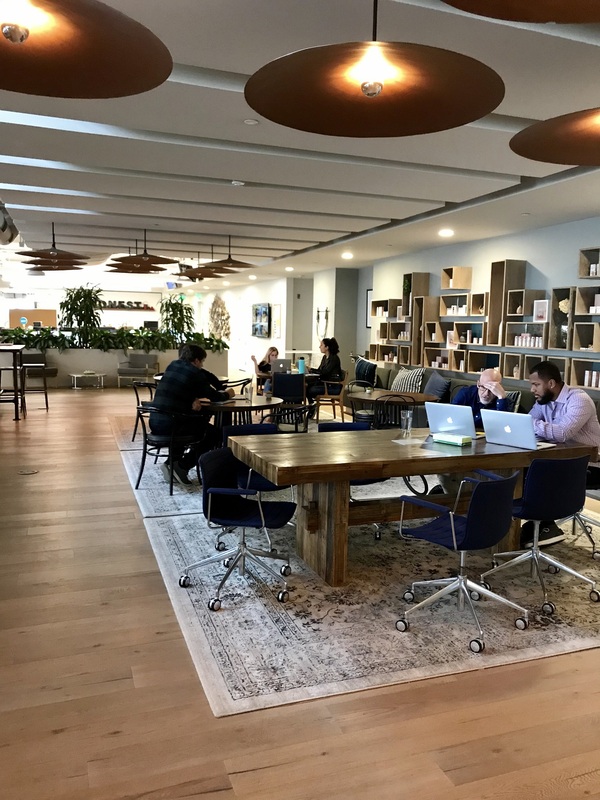 And if The Honest Company employees need a change of scenery, they can go work in one of the beautiful library-like common spaces or on the rooftop patio. My last visit was to Google and — no disrespect to Yahoo and The Honest Company — my mind was blown. As mentioned above, it was built in the former hangar for Howard Hughes’ Spruce Goose. Because it is a historic building, Google had to build ten feet from the interior face of all exterior walls and ceilings. As a result, all of the floors “float” in the building. 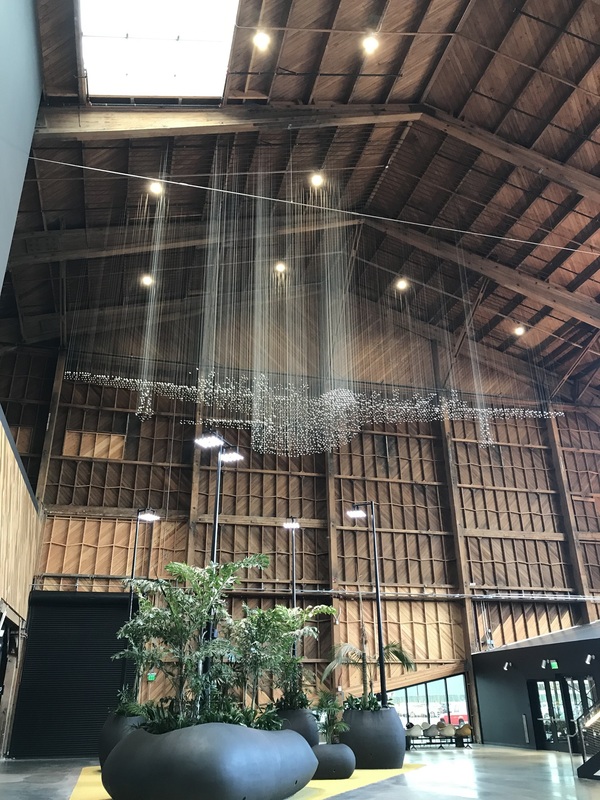 There are many nods to the building’s past, including this stunning ceiling installation in the shape of the Spruce Goose. In addition, Howard Hughes’ original office at the center of the highest portion of the building was preserved and converted into a conference room. 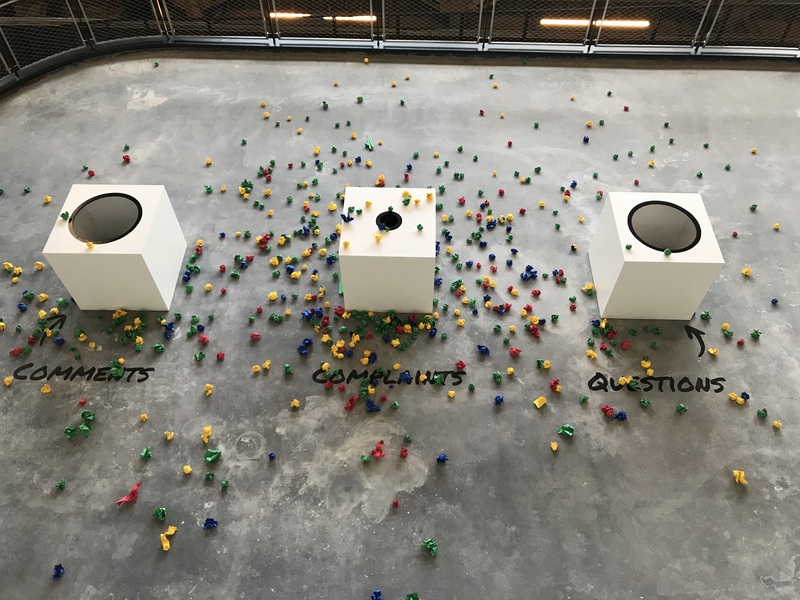 The space features amenities including a cafeteria with an in-house chef who gives regular Food Talks to interested employees and competes in competitions with other Google chefs nationally. There is a dreamy fitness center complete with personal trainers and numerous group exercise classes. And there is a nap room, meditation room, mother’s room, bike room (where you can borrow a bike or store your own), coffee bar, and massage room. No, the massages aren’t free but employees accrue Google Bucks as rewards that can be spent on massages and other things. 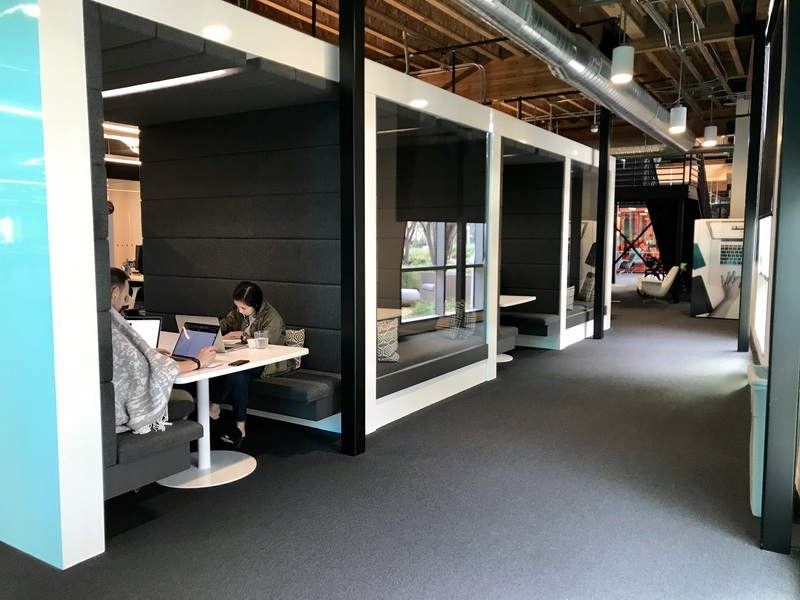 Google did something whimsical and brilliant with the future growth space that has yet to be furnished with desks and employees. Above the space, on a floating walkway sits a station where Googlers can get paper to build an airplane which they can then use to hit a target on the floor below. 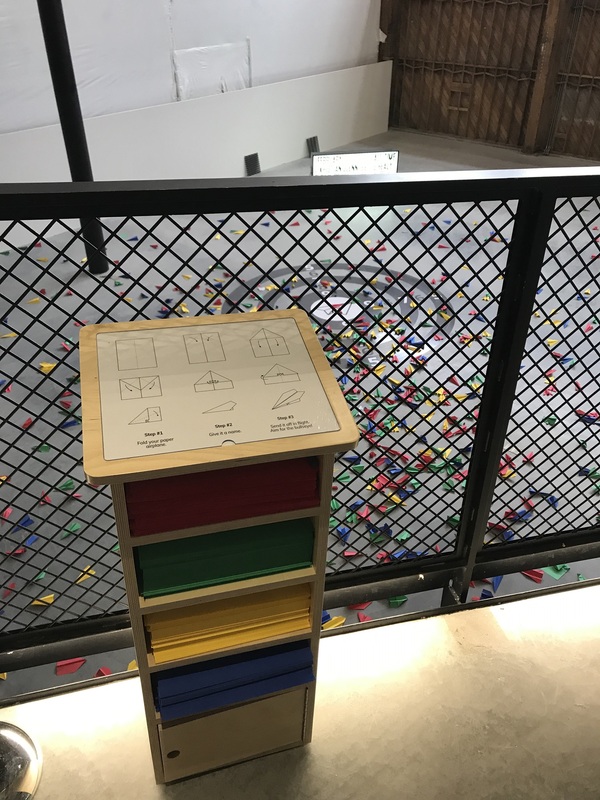 In another such growth space, Googlers can write comments, suggestions or complaints on a piece of paper and then try to toss that paper into the bins below. Notice the size of the opening on the complaints bin! 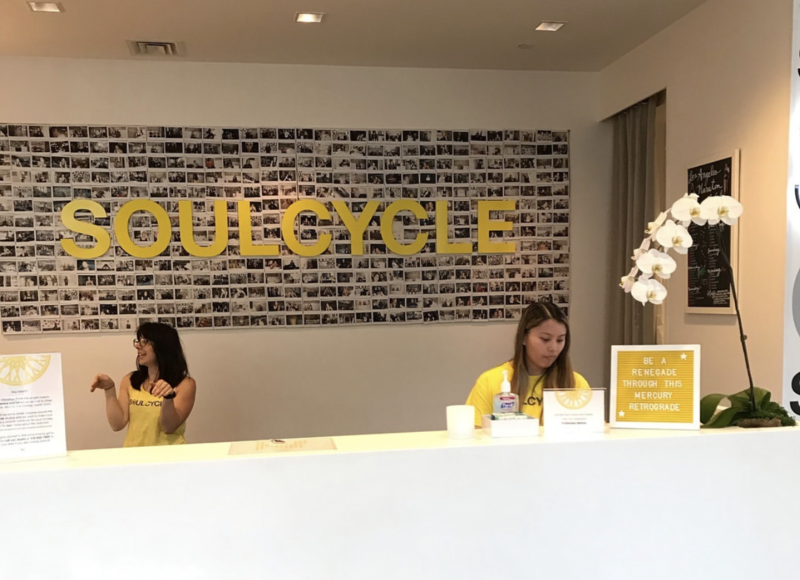 I have always wondered if SoulCycle would live up to the all the fuss about it. Since there was one a mile from my Santa Monica hotel, I paid the $20 first-timer’s fee and attended a class. And? It felt like every other spin class I have taken from a good teacher. Which is fine except that regulars pay $40 for a 45 minute class. What in the what? If this class does not make my tushie look like a tulip afterwards, I am not paying almost $1 per minute to ride a bike at 85% of my max heart rate. Nope. Walls in the lobby are lined with lockers and benches, and small but nice locker rooms are tucked behind the reception desk. The whole space is white with bright yellow splashes which make it feel bigger than it actually is. Way to maximize space while minimizing real estate costs. Experience Value: C-. Space Design: A+. I also gave drybar a whirl one morning. While a $49 blowout sounds indulgent on my part, I am calling it market research. 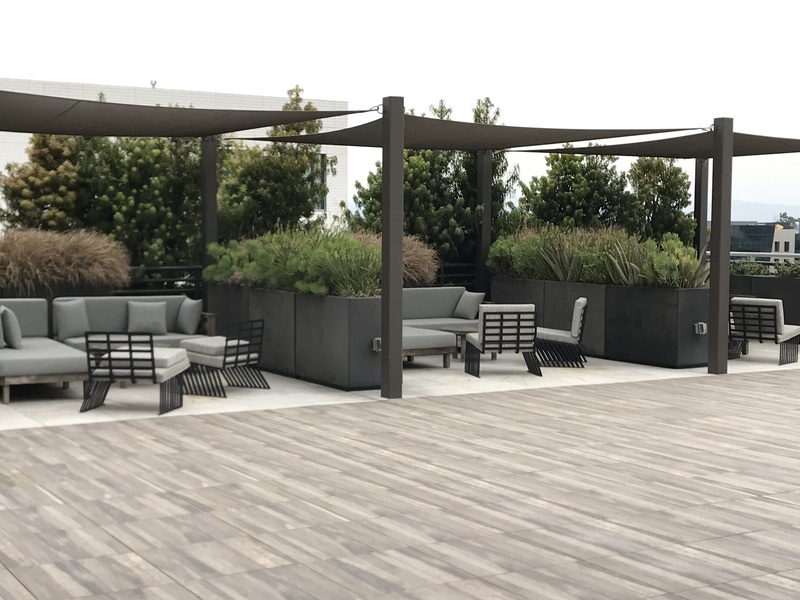 You see, my company is working on some large mixed-use developments and I can’t believe — given Birmingham’s reputation as the land of the “done” hair — that we have zero drybars here. The overall drybar experience is pampering. The space was incredibly well-designed to be both efficient and purposeful. There is a mid-sized rectangular front room with a central bar area around which all of the clients sit. The hairdressers work behind the clients while the clients sit and read, work or stare at their phones. Behind the front room is a small shampoo room with eight stations efficiently arranged to make the best use of the small space. Like SoulCycle, A+ for space design and minimizing real estate costs. My only reservation about my drybar experience is that I clearly don’t have thick or curly enough hair to justify paying someone else $49 to blow it dry – especially knowing I am going to have to wash it the next morning after the above-described SoulCycle workout. I DO think drybar would be an amazing addition to Birmingham’s retail scene and am now actively recruiting the company to the area! Robin had tons of knowledge on all things marketing and business development and gave me great insight prior to my speaking engagement. Between her and my Western Legal Leaders’ Dinner tablemate, Catapult’s Doug Johnson, I felt like I went back to Birmingham smarter. What a trip!